Every year, tens of millions of people flock to Florida for its sunny beaches and world-famous tourist attractions. Most never learn about the strange and unusual locations just off the beaten path. In the beautiful Florida Caverns, a second Rip Van Winkle was woken from one hundred years of sleep. The Green Swamp is home to murders, monsters and mysteries galore. A shining castle made of recycled material, built by an artist like no other, gleams within a Florida swamp. A spectral horse heralds tragedy and caused a notorious scandal in a central Florida city. 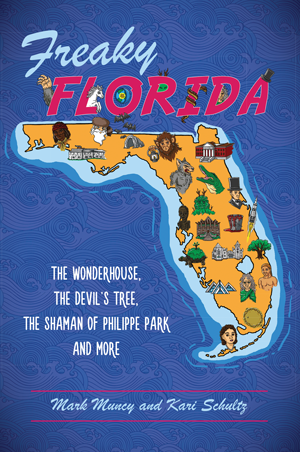 Join Mark Muncy and Kari Schultz as they share tales of Florida's myths, monsters, massacres and legends and the hidden history behind them. Mark Muncy is the creator of Hellview Cemetery, a charity haunted house in central Florida that was so infamous it was banned by the City of St. Petersburg. An author of horror and science fiction, he has spent more than three decades collecting ghostly tales and reports of legendary beasts. This is his second book for The History Press after the successful “Eerie Florida” in 2017. He lives in St. Petersburg, Florida, on the remains of an ancient midden with his fiancée, Kari Schultz. Occasionally, he is visited by his daughters when they remember he is still there. Kari Schultz is a varied illustrator at Fox Dream Studio who enjoys fantasy and horror. She has been working on art as long as she can remember and reading folklore and horror almost as long. She has a short comic featured in Uncanny Adventures: Duo #2 from 8th Wonder Press. This is her second work for The History Press. She has a thing for foxes. She occasionally ventures out of her dwelling in St. Petersburg, Florida, in search of cryptids. She can also at times be lured forth with ice cream.